This information is very useful for the deposit of articles on SSRN. Please contact the library for any clarification on the copyright of your research. Can you submit a forthcoming paper on SSRN ? 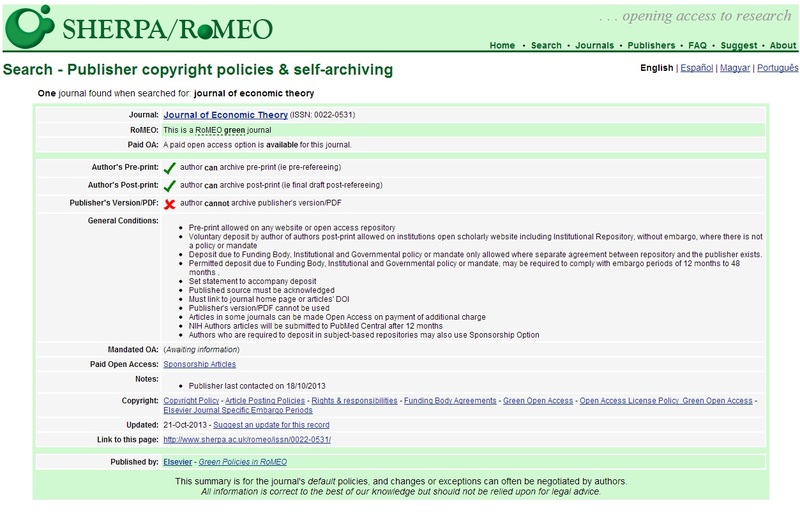 The screen shot example below shows a summary of the copyright policies for the Journal of Economic Theory. This review permits the submission of pre-print (ie pre- referral ) on all websites or open access sites, post -print ( ie final draft post- referral) but does not allow the editors’ final PDF pdf version to be uploaded. Do not hesitate to contact the library with any questions about forthcoming articles on SSRN . When querying information collected on the Sherpa / Romeo site, we carefully study journal guidelines available on their website or, if necessary, we ask them to let us know directly.